Literally light up your gaming life with these stunning RGB keyboards for gaming. Keyboard backlighting has become a popular feature in recent years and like most features, it continues to improve. RGB lighting is a color model that allows red, green, and blue light to combine together in various ways to produce a vast array of colors. Keyboards with advanced RGB lighting allows users to customize light layouts for different uses. The included software allows users to have the ability to light up one key or all of them in a multitude of colors. This feature is especially popular among gamers. By being able to light up certain keys used in high-action games, you can immediately press them without having to look and make sure you pressed the correct one. Users can also save and import their backlight profiles to share with others.Budget RGB keyboards do not feature customization but do include a number of preset lighting patterns. These patterns can vary from one-click lighting mode to response of typing speed lighting mode. These keyboards are fine for users just wanting a few backlight options, but if you are wanting the ability to customize each key, you may have to spend a little more. Before deciding on a certain RGB keyboard, be sure to consider other features you may want your new keyboard to have. We’ve listed several popular features below that are available in addition to RGB lighting. We’ve listed 10 popular, highly rated, RGB keyboards ranging from budget to high-end. 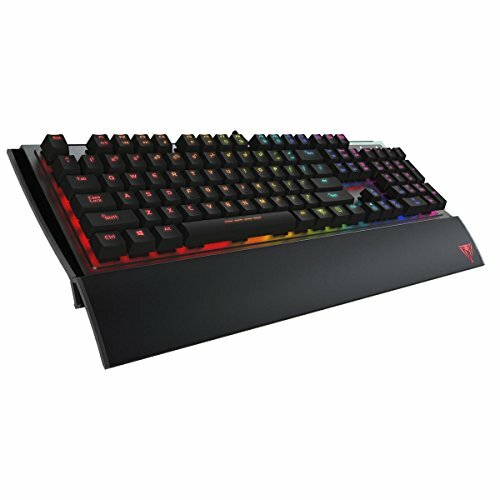 Each listing explains the amount of RGB customization available along with other features the keyboard may have. We hope this guide assists you in finding the perfect RGB keyboard to suit your needs. 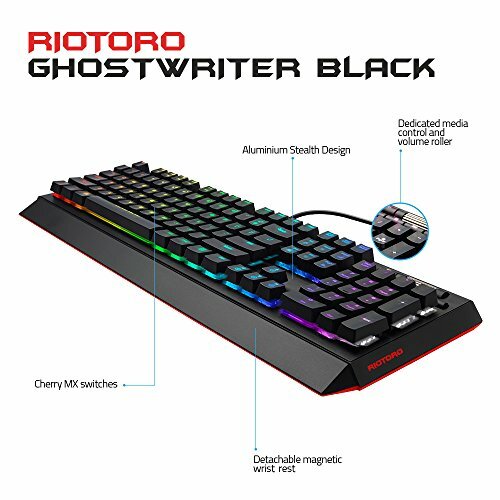 The Ghostwriter from Riotoro is an outstanding RGB keyboard. With a 1 ms response time, 100% anti ghosting and Cherry MX Black keys and full n key rollover it is up there with the best. For connectivity there are dual USB ports, for design there is a stylish aluminium face plate and a dedicated media control. 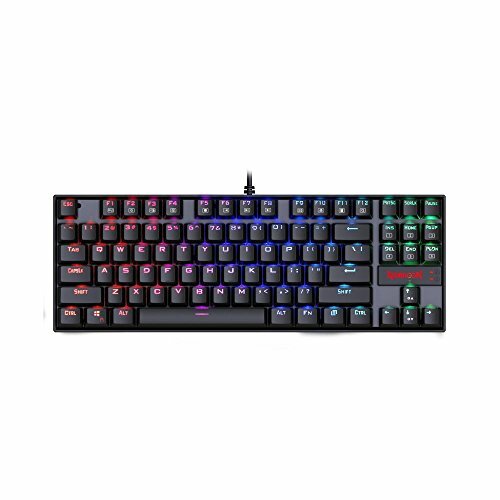 With the Ghostwriter Prism, the RGB lighting and effects can be simply programmed via keys, with numerous colors to choose from. Set up is simple and it also comes with a 2-year warranty. While the SADES K10S does not have customizable RGB backlighting, it does offer several great features for the price. 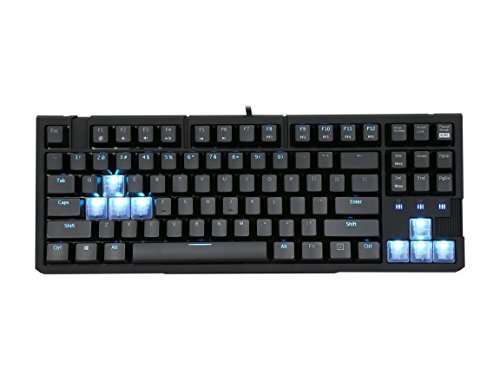 In addition to it being mechanical, it has 9 preset LED RGB backlighting options and 104 keys with n-key rollover which prevents ghosting. It contains Kailh blue switches for responsive feedback with each key press. 19 non-conflict keys, 7 multimedia keys, and 5 additional macro keys are excellent additions. The keys are individually backlit and can be adjusted. Windows keys can be disabled to prevent accidental key presses during high-active gaming. This ergonomic keyboard has a lot of great features and was also tested for 50 million keystrokes ensuring long durable use. The Rosewill RGB80 has 100% blue mechanical key switches that provide tactile feedback and an audible click. It contains 6 customizable LED backlit key modes including 5 for brightness and 1 for breathing. It also has 16.8 million LED color options. The 87 keys feature multimedia keys to adjust volume and media playback straight from the keyboard. 10 transparent game keys and a key puller for easy cleaning are also included. The n key and 6 key rollover prevent ghosting. The Rosewill RGB80 is a great affordable keyboard. While we haven’t reached the fully-customizable RGB lighting keyboards on the list yet, this keyboard has excellent features for those looking for a durable RGB lighting preset keyboard. The Redragon K552 features custom mechanical switches that are equivalent to Cherry MX green switches. The keys have medium resistance, tactile feedback, and an audible click. The RGB LED adjustable lighting has 6 preset backlighting effects. Each key cap is double-shot injection-molded for clear backlighting. Constructed of aluminum and ABS, this keyboard has 87 standard keys and 12 multimedia keys allowing volume control and media playback directly from the keyboard. A Windows key lockout option is available for uninterrupted high-action gameplay. This affordable keyboard is compatible with Windows 10, 8, 7, Vista, and XP. This mechanical gaming keyboard features Kailh brown key switches and 104 keys with anti-ghosting. The double color injection molding key caps are curved and have individual LED backlighting. There are multiple RGB backlit modes that are adjustable including 4 unique interaction modes. These modes include 1-click lighting mode, ripple backlit lighting mode, 1-click zone lighting mode, and response of typing speed lighting mode. Additional modes include 7-color breathing mode, always backlit on, side backlit, and scanning backlit left to right. So, while it doesn’t allow customization, it does offer several exciting backlight modes. Easy access multimedia keys are available for adjusting volume and media playback directly from the keyboard. It also features macro keys for 1-touch sequence keystrokes. An excellent mechanical keyboard for typing. 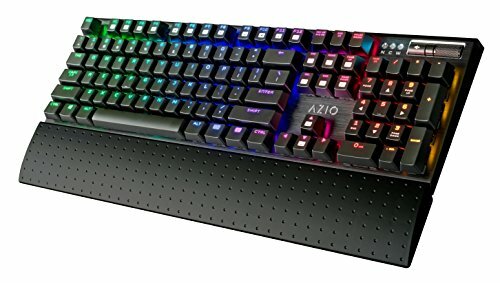 The Azio RGB keyboard features Kailh blue mechanical key switches that offer tactile feedback and an audible click. The RGB backlight has fully adjustable brightness levels and 6 preset lighting modes. The incredible gunmetal anodized aluminum faceplate only enhances the RGB feature. It also has easy access shortcut keys and volume control. Windows key lock is available for uninterrupted game play. A detachable palm rest is also included. 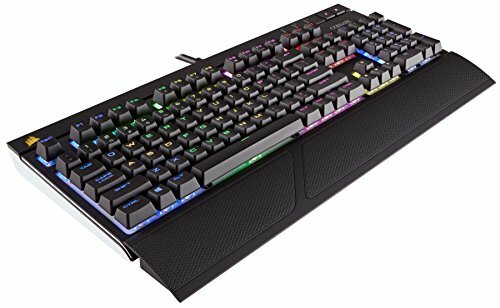 This is a great looking mechanical RGB keyboard priced mid-range making it a little pricier but not out of reach. The Patriot Viper is a macro lover’s dream come true. With 104 programmable macro keys, every possible gaming sequence can be accessed with the touch of a button. It features 100% Kailh mechanical brown switches that allow tactile feedback. The 104 key rollover prevents ghosting and 6 multimedia keys are easily accessible for volume control and media playback directly from the keyboard. The full spectrum RGB LED backlighting offers individual backlit keys. While not customizable, it is still a gorgeous keyboard. Made of aircraft grade aluminum chassis, it also features a 2-year warranty. A removable magnetic palm rest is also included. Here we start entering the higher range keyboards that offer complete RGB individual key lighting customization. 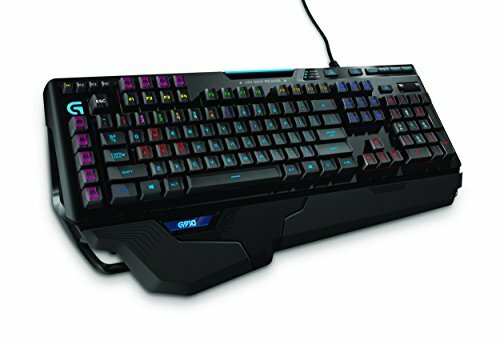 Per Logitech, it is the world’s fastest RGB mechanical gaming keyboard available. The exclusive Romer-G mechanical switches offer up to 25% faster actuation. Key lighting can be individually customized with over 16 million colors. It also features 9 programmable G-keys and macro keys. The 113 keys are anti-ghosting and media controls are also located directly on the keyboard. With Arx control applications and a smartphone dock, you can access in-game data on your phone or tablet without interrupting your gameplay. The Logitech Orion Spark has a tested lifespan of 70 million keystrokes. 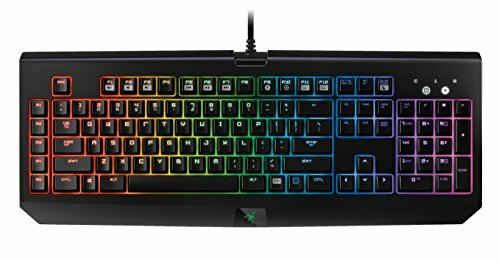 Razer’s BlackWidow Chroma keyboard features Razer Mechanical Switches specifically designed for gamers. These switches offer tactile feedback and a fast response. Chroma backlighting has over 16.8 million color options. Using Razer Synapse software, you can customize key lighting and sync your custom backgrounds to the preloaded backgrounds. Fully programmable keys, 5 additional macro keys, and easy access media keys are also available. 10 key rollover for anti-ghosting and volume control are also incorporated into this keyboard. 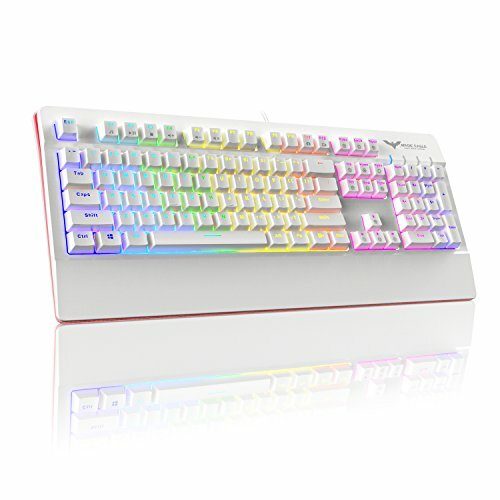 The BlackWidow Chroma has a 60 million keystroke lifespan and comes with a 2-year warranty. Corsair has many popular gaming keyboards available, and the STRAFE RGB mechanical gaming keyboard does not disappoint. Incorporating 100% Cherry MX key switches with a unique gold cross point, every key press is reliable and exact. The key switches have a wide actuation zone, no audible click, and no tactile feedback. 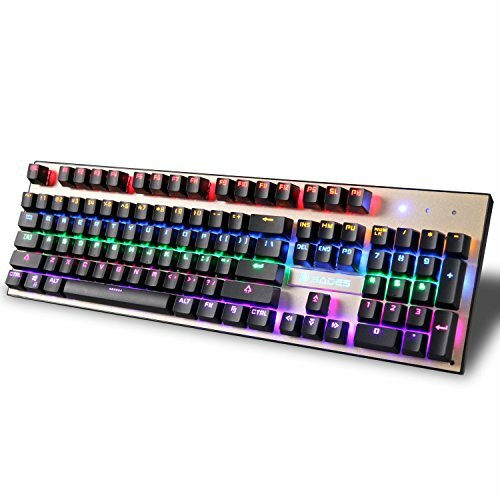 The multi-color backlighting provides unlimited adjustments allowing you to fully program every individual key. Macro keys are abundant for gamers and FPS/MOBA key cap sets are textured and contoured for smooth accessibility. 100% anti-ghosting is provided by the 104 key rollover. CUE link allows connection to compatible Corsair keyboards, headsets, and mouse to work together creating a glorious lighting experience. The free RGBShare community allows users to set up and share STRAFE RGB custom lighting modes for all games. A detachable soft-touch wrist rest is also included. KeyboardQueen.com is a participant in Amazon Associate Program. It may receive compensation from affiliate sales from links leading to Amazon.com and its properties.